With the modern way of life more and more people will find they need eye surgery. Even though the paperless office is still a long way off for some there is still far too much time sat in front of a computer screen. Add to this the hand held games and machines connected to the television our eyes are under siege in a way they have never been before. If you are based in London and need eye surgery one of the best places to go to will be the London Vision eye surgery clinic. There have already been a number of famous people who have used the clinic and have allowed them to use their names including Philip Schofield and Dr Hilary Jones. With London vision eye surgery there is always the intention of making sure that each procedure is suited to the particular person and not all operations will be carried out in the same way. If you want to have your procedure carried out and be off the books as soon as possible then this is not the clinic for you. The emphasis is getting the job done properly not getting the job done quickly. Standard Treatment. This costs £128 per month - £4,600 in total and includes both eyes being lasered to improve long or short sight. The price includes the consultation which has to happen or surgery will not take place. The surgery which will be LASIK or LASEK and One year’s aftercare. Laser Blended Surgery - £128 per month and £4,600 in total. 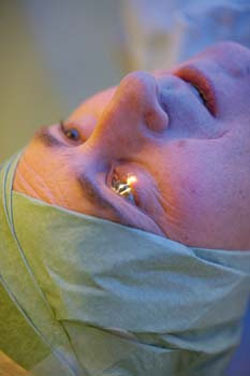 Here the surgery will be LASIK or LASEK but in this instance near vision is also corrected. The consultation is included in the price and there is also 1 year’s aftercare. High Profile Treatment is £175 per month or £6,300. The procedures are the same but in this case the patient will have severe problems with their sight. The London Vision eye surgery clinic is on Harley Street and they can be contacted by e mail or if you want to discuss treatment even before the consultation it is possible to phone and ask any questions you have. If you have a very complex case it will be best to look elsewhere as here the emphasis is on less detailed cases meaning that there will not be a great deal of surgeon time on one patient. It also means that if the same procedures are carried out regularly the surgeons will soon become experts and mistakes will not be made. To ensure this already is the case staff do take time with each patient with the aftercare provided.